ALPHONSE MARIA MUCHA, July 24, 1860 – July 14, 1939, a czech artist who studied in paris and munich, produced an immense amount of paintings, posters, advertisements, and book illustrations, as well as designs for jewellery, carpets, wallpaper, and theatre sets in what was initially called the MUCHA STYLE but became known as ART NOUVEAU ( new art ). 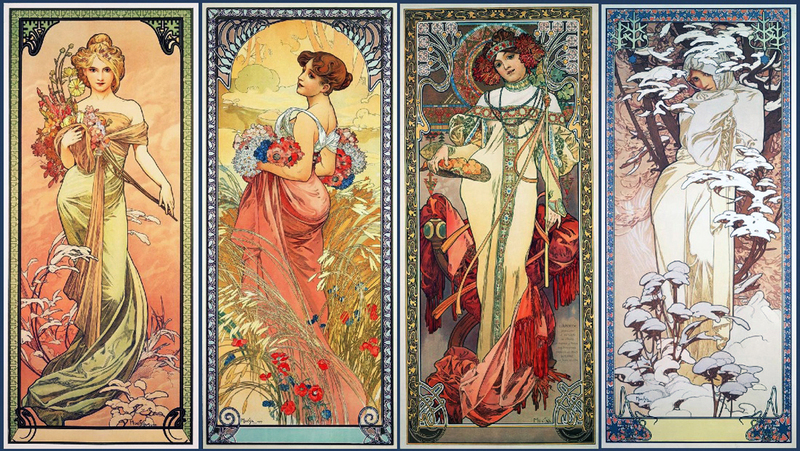 MUCHA’S works frequently featured beautiful young women in flowing vaguely neoclassical looking robes, often surrounded by lush flowers which sometimes formed haloes behind the women’s heads. 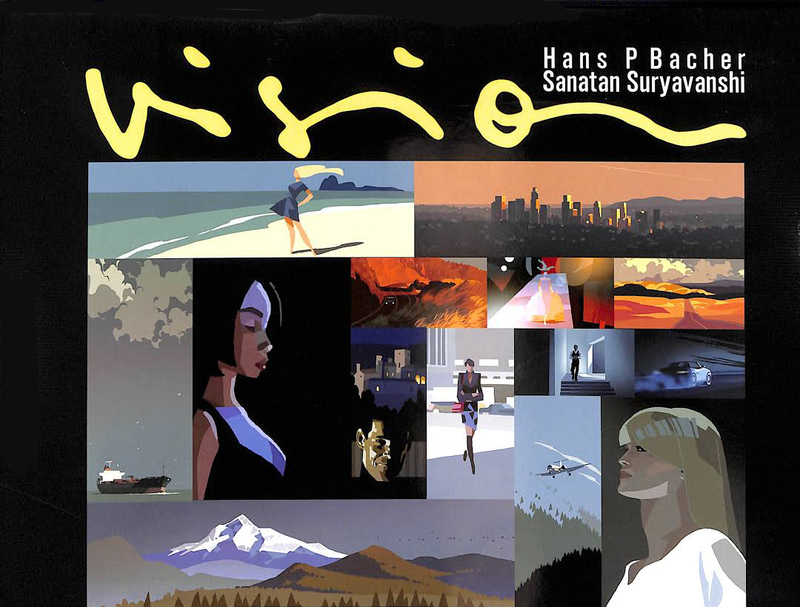 In contrast with contemporary poster makers he used pale pastel colors. 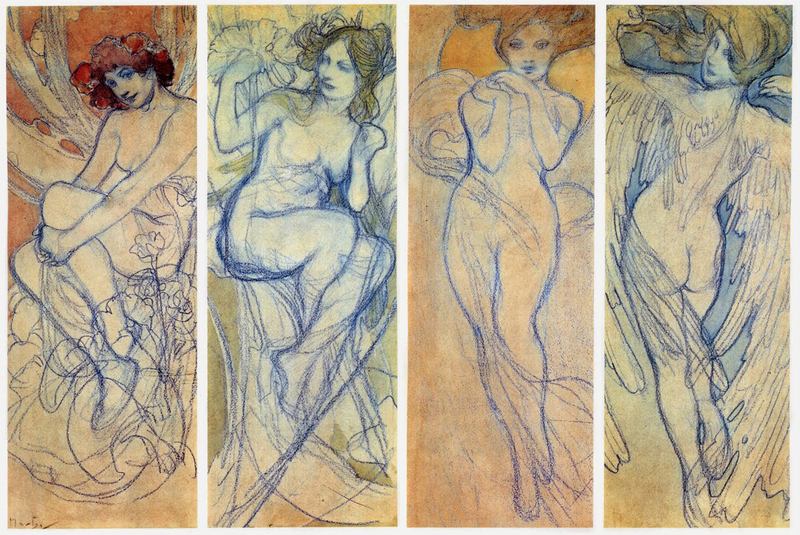 the ART NOUVEAU style however, was one that MUCHA attempted to distance himself from throughout his life. he always insisted that rather than adhering to any fashionable stylistic form, his paintings came purely from within and czech art. he declared that art existed only to communicate a spiritual message, and nothing more. 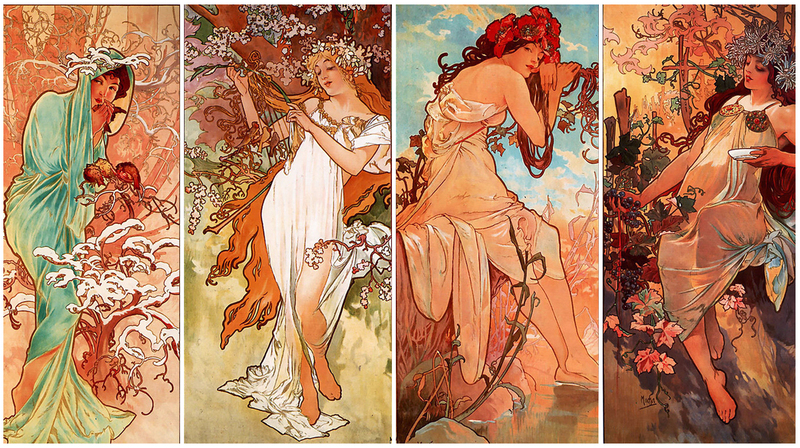 THE SEASONS, 1896, was MUCHA’S first set of decorative panels and it became one of his most popular series. 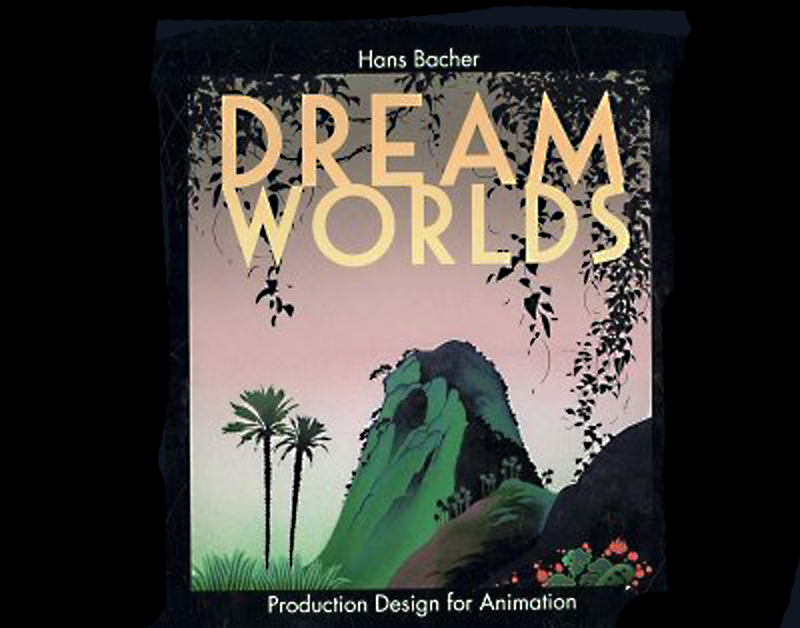 it was so popular that he was asked to produce at least two more sets based on the same theme in 1897 and 1900. designs for a further two more sets also exist. 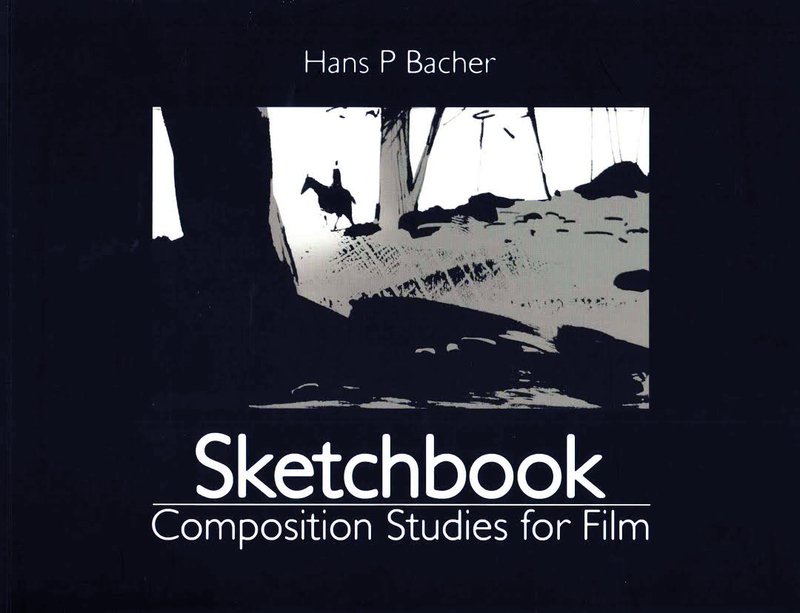 the idea of personifying the seasons was nothing new – examples could be found in the works of the old masters as well as in other publications at that time. 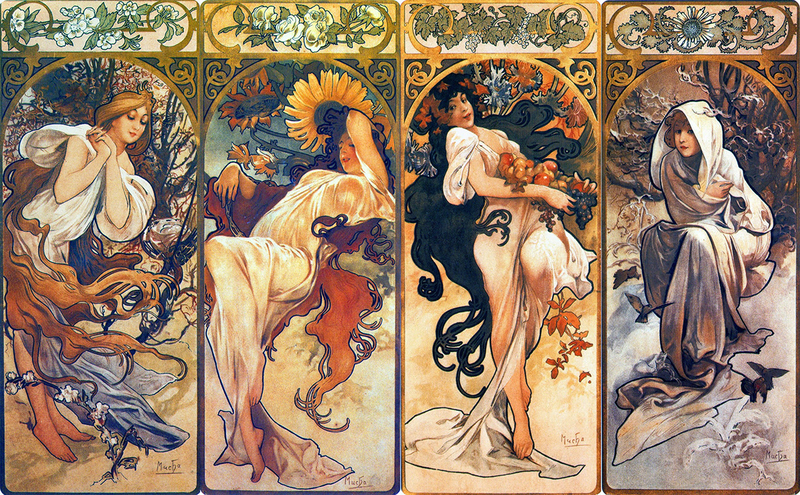 however, MUCHA’S nymph-like women set against the seasonal countryside background breathed new life into the classic theme, MUCHA captures the mood of the seasons – innocent spring, sultry summer, fruitful autumn and frosty winter.